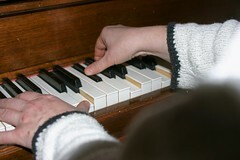 As part of the girls’ homeschool education, I want them to know how to play at least two different musical instruments. During the past nine months, Sophia has been learning how to play the piano. I thought about starting lessons earlier; however she has learned how to play easily this year and is motivated to practice multiple times each day. Her piano teacher said she progressed through more books/levels than any other student this year. To me, that’s a good sign that it was the right time for her to begin learning how to play an instrument. Beginning with the next school year (fifth grade which starts in July since I homeschool the girls year-round), I suggested that she learn to play an instrument in addition to the piano (either one that could be played in the orchestra or band). She picked the harp. Sophia learning how to play the harp. So, a couple weeks ago, we went to Musicmakers – a company that sells a variety of harps and other string instruments. 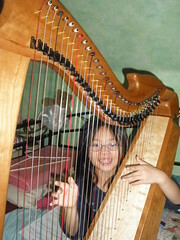 After looking at the different harps, we chose this one: a 31-string harp that is 54″ tall. It weighs about 24 pounds so it’s pretty easy to carry around…just a bit awkward. This particular harp has all the levers on it already. 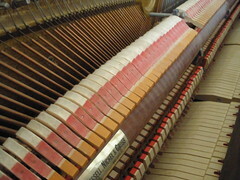 Though it isn’t necessary at this stage to have levers on a harp, if she’s interested in the instrument long-term it’s good to have the levers on so she’ll be ready to use them. Some of the strings on Sophia’s harp are different colors (e.g., C is red, F is blue) which helps the player find the string/note much easier. As mentioned, Sophia knows how to play the piano. I also know how to play the piano (thanks to my parents who paid for ten years of piano lessons for which I’m so grateful!). Knowing how to read music – especially piano music – is very helpful when playing the harp since there is some similarity between the two instruments. while it was being tuned. To me, an important part of playing instruments is the desire and willingness to share one’s gifts with others. Starting as early as four months into playing, Sophia began participating in recitals. 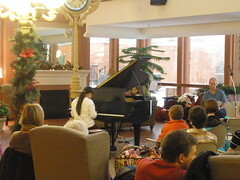 She played in one in December at a nursing home with other students who are homeschooled and one in May at a church also with homeschool students. Both were attended by well over 150 people. 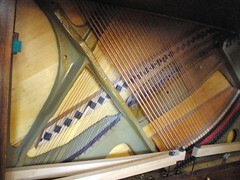 For both recitals, she memorized two pieces, and was able to play them on a grand piano. Getting comfortable playing an instrument in front of an audience from the beginning is much easier than doing your first recital after years of playing. Sophia playing a piece at her first recital. Olivia, who is 8 years old, will be starting piano lessons this summer. Sophia has been teaching her how to play some songs from her first music books; and Olivia practices each day…just like her older sister. 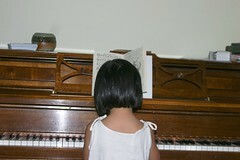 Olivia, at age 5, already wanting to play the piano. Although choosing a second instrument to play comes later in elementary school, Olivia has expressed interest in playing the piccolo (although she has to learn the flute first in order to play the piccolo I’ve been told). She also wants to play the guitar, but needs to wait until fourth grade when her hands are large enough to play a standard-size guitar. Olivia said, though, after hearing the harp and seeing her sister play it, “Well…maybe I might want to play the harp instead.” So many possibilities in the mind of a child! Olivia trying her hand at playing the harp. My oldest daughter loves the piano! She tried flute for a while but was not passionate about it. I wonder what she would think of the harp…..Stopping by from HHH! It's so good to see kids loving music and playing instruments. Some just have the desire and dive right in. Our son tried piano for a couple years, and while he has the "ear" he does not have the desire to perform (in fact, he's quite averse to the idea). We tried again this year with percussion in school. Again, he has the skill, but not the desire to play for anyone. So, no more music lessons for him. Our daughter, however, loves singing in chorus, and next year (4th grade) she'll have the option of picking up an instrument. We'll see if she's interested. Love the harp! I play the clarinet and have been waiting to see if my children express an interest in an instrument as well, they are only 5,4 and 3. I don't want to overwhelm them at an early age. What an inspiration! I would love to have my children play an instrument, let alone 2! Very impressed! Do you know about Daisy Rock guitars for girls? They're smaller than standard, so girls can start playing them while they're younger. My daughter has one. She got it 2 yrs ago. She's 14 now and still using it. She has just started playing it in front of others to lead worship. She loves her guitar!